This photograph, found in a junk shop many miles from where it was taken, apparently portrays the draymen of McEwan’s Fountain Brewery, which was founded in 1856 by the brewer-politician William McEwan, donor of Edinburgh University’s magnificently grandiose McEwan Hall. 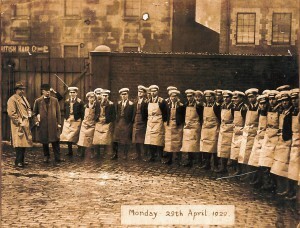 The photograph is dated 1929: depression was biting, and the following year McEwan’s would merge with its rival William Youngers in order to survive. Physical strength was obviously a prerequisite for the job, and in 19th century popular culture the drayman became something of a champion. He was not however known for his radical politics. Punch magazine noted that draymen were among the first to enrol as Special Constables in April 1848 to protect the City against a Chartist demonstration. The draymen of Barclay and Perkins’ brewery, which was on Bankside, stepped into the limelight in 1850 when General Haynau of Austria, who had notoriously ordered the flogging of Mme Madersbach, a Hungarian aristocrat, visited the brewery. He was met by a hostile crowed of draymen and labourers and was forced to flee and take refuge in a dustbin, from which he was eventually rescued by police. That fount of Victorian wisdom, Haydn’s Dictionary of Dates, tells us that in 1858 there were 205 great brewers in England and 40,418 licensed brewers. According to the Findmypast indexes, the census of England, Scotland and Wales of 1851 identified 604 men as draymen (or brewer’s draymen or brewer’s carters), of which 119 were in Scotland. (The total population at this date was around 20.9 million.) In 1881, a handful of draymen’s wives were also described as draymen: in most cases, the description has been struck through by the enumerator but against one the word ‘milkseller’ has been added, an indication that some of the draymen were probably milkmen, not brewery carriers. ‘In the case of the brewers’ drayman who carried a heavy barrel on his right shoulder, the spine had become adapted to meet its burden’. The industry had yet to embrace the culture of health and safety, in which it is now classed (in the US) in the category of ‘Material Moving Workers, All Other’. In the UK, while the horse has been replaced by the engine, the old word is still used, resonating down the centuries in honour of this essential British occupation.